Picnic Lunches and restaurants are at the top. Below that are 'Lunch at a Winery' Options. For any type of picnic lunch, style of food or restaurant, please let us know before your tour so we can achieve your request. ​Most wineries don't offer lunches or snacks but most offer places to bring your picnic lunch--like Torii Mor Japanese Garden (right) and De Ponte (left). We invite you to join us for Chef Henry's Farm & Forage, a new culinary experience that pairs six bites with six of our wines! We believe that one of the best ways to fully enjoy our wines is to pair them with carefully crafted bites. Watch the magic happen from your seat at the Kitchen table. Farm & Forage is offered every Thursday and Friday at 1:00pm, and Saturday at 11:00am and 1:00pm. To provide you with a personalized experience, we limit each time frame to just eight guests. The "dine" portion of this experience is equivalent to lunch. $75 per person; $60 or 1800 points for Cellar Club members. Reserve your seat at the table by contacting us at info@sokolblosser.com or 503-864-2282. A delicious assortment of locally produced cured meat, aged gouda, hazelnuts, and crackers. Join us for a guided tasting of local Oregon cheeses carefully paired with some of Adelsheim’s most exclusive wines. Picnics Not Allowed. However, they offer Pizza Wednesdays (Wood-Fired Wednesdays) July - August | 4:00pm to 7:00pm Starting July, come join them every Wednesday afternoon from 4:00 pm - 7:00 pm for Pinot & Pizza! In partnership with Red Hills Market, they're offering a perfect place to stop, relax, and enjoy the Willamette Valley at the best time of the year. Each Wednesday, RHM will bring their 1949 retro-fitted Farm truck, complete with Italian wood fired oven, and for $25 you can enjoy a pizza and glass of DDO on their deck. General Hours: Fri.–Sun., 11:30 a.m. to 4:30 p.m. (or by appointment). Pizza Time: Saturdays during summer (and for private events). Most Popular Pizza (tie): Margherita: Buffalo mozzarella, Pomodoro tomatoes, basil and extra virgin olive oil. Pairing: Lachini Family Estate Pinot Noir. Most Popular Pizza (tie): Wild mushrooms, lamb sausage with pesto sauce and extra virgin olive oil. Pairing: Lachini La Bestia Cabernet Sauvignon. Most Unusual Pizza: Pork shoulder with pear, fresh arugula and virgin olive oil. Pairing: Lachini Rosé of Pinot Noir. What makes your pizzas and/or oven special? Being in the middle of a beautiful vineyard with tremendous views to the south (Dundee Hills) and west (Ribbon Ridge/sunsets) is a slice of heaven. Pizza Advice: Get the temperature of your oven ideally between 750°F to 850°F. Use fine polenta meal or semolina flour to easily slide pizza around/remove from the oven. Use fresh dough (versus store-bought), but if you’re in a pinch, Whole Foods is decent. General Hours: Daily, noon to 5 p.m. (summer Saturdays until 7 p.m.). Pizza Time: Saturdays and Sundays. Guests enjoy Left Coast’s outdoor ambiance while sipping wine and eating pizza. Photo by Kathryn ElsesserMost Popular Pizza: Classic Margherita: House-made tomato sauce, fresh tomatoes, fresh mozzarella and basil. Pairing: Left Coast Cellars 2014 Cali’s Cuvée Pinot Noir. Most Unusual Pizza: Sliced fresh pear, thin-sliced prosciutto, arugula and a drizzle of estate honey. 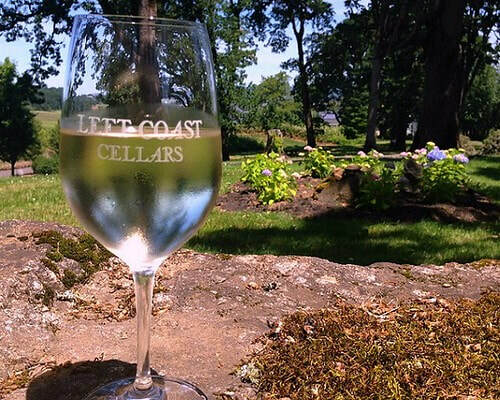 Pairing: Left Coast 2015 The Orchards Pinot Gris. What makes your pizzas and/or oven special? Our wood-fired Forno Bravo oven is fueled by oak logs from our estate. Our dough is homemade and used to hand-craft thin-crust Neapolitan-style pizza. Pizza Advice: Get your oven as hot as possible (ours runs around 750°F). Pre-heating a pizza stone makes this easier to achieve. 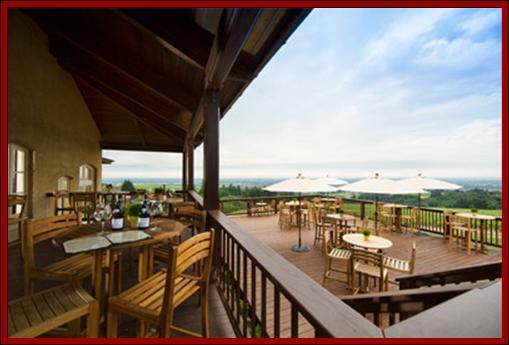 Canas Feast Winery (Carlton), 503.852.0002 (Italian Winery) 750 Lincoln St. Carlton. Does not serve lunch but offers nibbles to purchase and snack on (crackers, cheese, salami, olives etc. with plates & utensils for a picnic lunch)Snack platter for 2 is $18. "The new outdoor patio at Blakeslee Winery, officially named "the Piazza" will specifically be a wine and food patio. We will be serving pizza cooked in our new stone fire pizza oven and we will also offer "24 hour call ahead" personalized picnic lunches. Our open green spaces will also feature picnic tables for you to enjoy your food and wine. With the addition of the Piazza, we now have four different areas for you to enjoy your wine tasting experience." We offer picnic lunches, and request that orders be placed 24 hours in advance. We will try to stock extra lunches. Placing orders in advance will guarantee you receive exactly what you want. Enjoy the varietals that are at their best when chilled! Our Rieslings, Chardonnay's, and, our summer favorite Rose' of Pinot Noir are all amazing! The Rose' of Pinot Noir is selling quickly, and we suggest you stock your wine fridge or cellar before we sell out of our "summer gold." *Tour, Tasting and Picnic Lunch at Hyland EstatesStep 1, Walk with wine for a tour of NW Wine Co. Step 2, return to tasting room to sample the current offering. Step 3, enjoy a glass of wine with a picnic lunch prepared by one of our local restaurant partners, Red Hills Market or The Babica Hen. Advance notice required if Hyland is providing lunch. Approximately 1 hour and 30 minutes. $60 per person. Reservation required 48 hours in advance. Snack/lunch platters: The $40 Antipasto Platter is good for a light lunch for 2-3 ppl. The $22 Garden Platter is a snack for 2 ppl. Kitchen is open 11am-4pm. $25/board - Good for lunch for 2 ppl. or a snack for 4 ppl. Available for walk-ins for small groups but call ahead to be sure or for large groups. In case you don't know, they have welcomed Abby McManigle to the Brooks team as Executive Chef. Not only does that mean the harvest crews have some high expectations for lunches, but she is creating new bites and programming for our customers. Her first Chef Series dinner is already sold out (look for more Chef Series dinners). But, you can stop by any day of the week for our new Boxed Lunches! Visit our Bites, Sips, and Pairings page for all of our offerings. Daily MenuServed daily from 11 am to 6 pm, until 7:30 pm on Fridays, in our Estate Tasting Room by our Winery Chef, the menu features fresh and local ingredients to enjoy with our wines. General Hours: Sat.–Wed., 11 a.m. to 6 p.m., Thurs.–Fri., 11 a.m. to 8 p.m.
Pizza Time: Fri.–Sun. (see times above). Most Popular Pizza: Caprese: vine-ripened heirloom tomatoes (Kundalini Farms), Italian buffalo mozzarella, fresh basil, sea salt and zesty basil vinaigrette. Pairing: Willamette Valley Estate Chardonnay. Most Unusual Pizza: Heirloom tomato sauce, zesty Italian sausage with Spanish olives and cremini mushrooms. Pairing: Willamette Valley Bernau Block Pinot Noir. What makes your pizzas and/or oven special? Featured in the center of our tasting room is an interactive open kitchen where winery chefs create delicious wood- and vine-fired flatbreads to pair with our wines. Pizza Advice: Be sure to have good water for the dough and an oven that can get hot enough to crisp the bottom. Standard TastingOur standard flight of current releases can be paired with our charcuterie and cheese board for an additional $15. When touring Oregon's wine country, My Chauffeur encourages you to seek out neighboring creameries and wineries for pairings sure to please. Buy a variety of cheeses, go to a winery, find a scenic spot and have a picnic. That's what fine wine & cheese is all about.